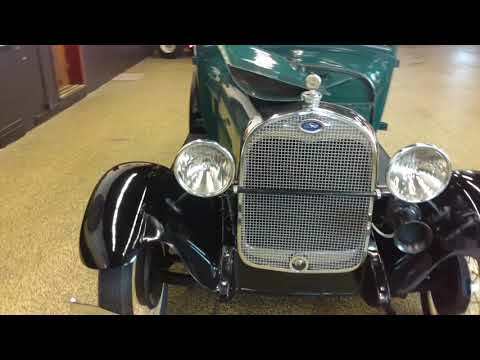 1929 Ford Model A Tudor Sedan, very solid. TRADES? Check out this Model A just offered for sale! This has to been one of the nicest examples of a 1929 Ford Model A Tudor Sedan we have seen here at Unique in quite a while. This A was owned for quite some time by the owner of a local Ford dealership. It was very well maintained and driven regularly in parades and has been kept mechanically sound. A lot of customers ask us if these old cars still sell well and the answer is "yes" especially when they're in the condition this one is. Take a look at the pictures of the paint, top, and interior, they may not be perfect but they're as nice as you'll see on a car that's driven and not sitting in a museum. This car is all steel including the fenders and boards. We've taken the car down the road and it drives out true and smooth. If you're looking for a Model A to take in parades, car show, or local cruise ins this one would work for all of the above. Check out the pics, video and give us call if you would like to discuss this beautiful A. Clear MN title in hand...vehicle is titled as a 1929 Ford 2dr. just like it should be! We can be reached at 507-386-1726 or email "sales@uniquemankato.com"
ALL TRADES AND OFFERS WILL BE CONSIDERED...FINANCING IS AVAILABLE!